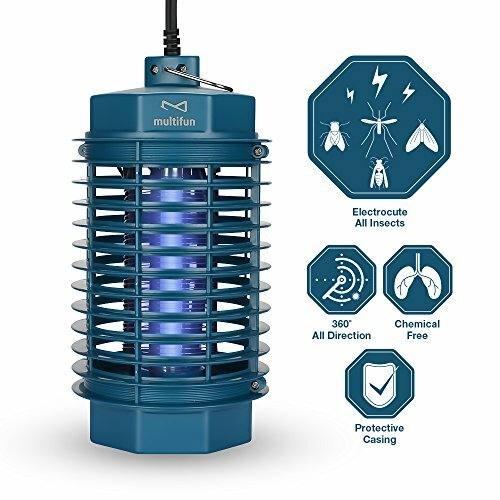 multifun indoor bug zapper features a high intensity 5W ultraviolet bulb and a high-voltage electrical grid to lure flying bugs from all directions, the fly trap indoor eliminates dozens of insects instantaneously. The casing of this mosquito killer is made of high quality fire-resistant ABS material, very strong and durable. This electronic insect-control system lures in the bugs and kills them with electricity instead of pesticides or other dangerous chemicals and thus odor-free, chemical-free and smoke-free. The casing has a safety-measured design to prevent children or animals from accidentally touching electric grid - reducing the risk of burns and electric shock. This lightweight mosquito killer is designed for great portability and to be carried along to anywhere insect control is needed. Simply plug in to get it to work and regularly empty the dead insects collected at the bottom tray of the unit. Clean the electric grid with accompanying cleaning brush. (Enter code: O97W5TQT get a free nose ear trimmer )【INSTANT & EFFECTIVE INSECT CONTROL】 Adopting the latest ultraviolet lamp on the market that is naturally attractive to bugs, our fly trap gets mosquitoes, moths, flies into the device and instantly electrocutes with extremely powerful high voltage electrical grid. Also designed to spread light in all four directions, the indoor fly trap eliminates dozens of insects right away and vastly reduces the insect population in your area. 【SAFE, CHEMICAL & ODOR FREE】Made of durable fire-resistant ABS material, non-toxic, odorless and smokeless. the bug zapper electrocutes any flying insects that are attracted to ultraviolet light without the use of any pesticides or dangerous chemicals. You and your family can be worry free from those disease-carrying bugs and enjoy the summer days like they're meant to. Great electric fruit fly trap device. 【PORTABLE & VERSATILE】This lightweight mosquito killer is designed for portability and be carried along easily to anywhere insect control is needed. With the attached ring on the zapper, you can easily hang it on wall or suspend it to ceiling to keep out-of-reach from children and pets. The fruit fly trap is very suitable for homes, kitchens, restaurants, hotels, schools, warehouses, farms, patios or yards. 【USER-FRIENDLY & EASY TO CLEAN】Indoor Mosquito trap is a great solution for eliminating annoying insects with less personal involvement. Simply plug in and the disposable fly traps do the rest for you. Electrocuted insects will get be collected at the bottom tray of the unit, which can then be easily detached for easy cleaning. 【WORRY-FREE PURCHASE】Measures φ4.84 x H 9.25 in; Power cord length: 4.59ft; Power: 5W; It is a perfect indoor or outdoor mosquito killer and bug zapper to protect and prevent from irritating bugs. Enjoy worry-free purchase from multifun with 90-DAY MONEY BACK and 12-MONTH WARRANTY. If you have any questions about this product by multifun, contact us by completing and submitting the form below. If you are looking for a specif part number, please include it with your message.